The following paper was originally published online as part of a design-based research conference funded by AERA and held at the University of Georgia in 2013. It was then revised for inclusion in this book. Design-Based Research (DBR) is one of the most exciting evolutions in research methodology of our time, as it allows for the potential knowledge gained through the intimate connections designers have with their work to be combined with the knowledge derived from research. These two sources of knowledge can inform each other, leading to improved design interventions as well as improved local and generalizable theory. However, these positive outcomes are not easily attained, as DBR is also a difficult method to implement well. The good news is that we can learn much from other disciplines who are also seeking to find effective strategies for intertwining design and research. In this chapter, we will review the history of DBR as well as Interdisciplinary Design Research (IDR) and then discuss potential implications for our field. These two types of design research, both DBR and IDR, share a common genesis among the design revolution of the 1960s, where designers, researchers, and scholars sought to elevate design from mere practice to an independent scholarly discipline, with its own research and distinct theoretical and methodological underpinnings. A scholarly focus on design methods, they argued, would foster the development of design theories, which would in turn improve the quality of design and design practice (Margolin, 2010). Research on design methods, termed design research, would be the foundation of this new discipline. Design research had existed in primitive form—as market research and process analysis—since before the turn of the 20th century, and, although it had served to improve processes and marketing, it had not been applied as scientific research. John Chris Jones, Bruce Archer, and Herbert Simon were among the first to shift the focus from research for design (e.g., research with the intent of gathering data to support product development) to research ondesign (e.g., research exploring the design process). Their efforts framed the initial development of design research and science. An engineer, Jones (1970) felt that the design process was ambiguous and often too abstruse to discuss effectively. One solution, he offered, was to define and discuss design in terms of methods. By identifying and discussing design methods, researchers would be able to create transparency in the design process, combating perceptions of design being more or less mysteriously inspired. This discussion of design methods, Jones proposed, would in turn raise the level of discourse and practice in design. Archer, also an engineer, worked with Jones and likewise supported the adoption of research methods from other disciplines. Archer (1965) proposed that applying systematic methods would improve the assessment of design problems and foster the development of effective solutions. Archer recognized, however, that improved practice alone would not enable design to achieve disciplinary status. In order to become a discipline, design required a theoretical foundation to support its practice. Archer (1981) advocated that design research was the primary means by which theoretical knowledge could be developed. He suggested that the application of systematic inquiry, such as existed in engineering, would yield knowledge about not only product and practice, but also the theory that guided each. It was multidisciplinary social scientist Simon, however, that issued the clarion call for transforming design into design science (Buchanan, 2007; Collins, 1992; Collins, Joseph, & Bielaczyc, 2004; Cross, 1999; Cross, 2007; Friedman, 2003; Jonas, 2007; Willemien, 2009). In The Sciences of the Artificial, Simon (1969) reasoned that the rigorous inquiry and discussion surrounding naturally occurring processes and phenomena was just as necessary for man-made products and processes. He particularly called for “[bodies] of intellectually tough, analytic, partly formalizable, partly empirical, teachable doctrine about the design process” (p. 132). This call for more scholarly discussion and practice resonated with designers across disciplines in design and engineering (Buchanan, 2007; Cross, 1999; Cross, 2007; Friedman, 2003; Jonas, 2007; Willemien, 2009). IDR sprang directly from this early movement and has continued to gain momentum, producing an interdisciplinary body of research encompassing research efforts in engineering, design, and technology. Years later, in the 1980s, Simon’s work inspired the first DBR efforts in education (Collins et al., 2004). Much of the DBR literature attributes its beginnings to the work of Ann Brown and Allan Collins (Cobb, Confrey, diSessa, Lehrer, & Schauble, 2003; Collins et al., 2004; Kelly, 2003; McCandliss, Kalchman, & Bryant, 2003; Oh & Reeves, 2010; Reeves, 2006; Shavelson, Phillips, Towne, & Feuer, 2003; Tabak, 2004; van den Akker, 1999). Their work, focusing on research and development in authentic contexts, drew heavily on research approaches and development practices in the design sciences, including the work of early design researchers such as Simon (Brown, 1992; Collins, 1992; Collins et al., 2004). However, over generations of research, this connection has been all but forgotten, and DBR, although similarly inspired by the early efforts of Simon, Archer, and Jones, has developed into an isolated and discipline-specific body of design research, independent from its interdisciplinary cousin. The initial obstacle to understanding and engaging in DBR is understanding what DBR is. What do we call it? What does it entail? How do we do it? Many of the current challenges facing DBR concern these questions. Specifically, there are three issues that influence how DBR is identified, implemented, and discussed. First, proliferation of terminology among scholars and inconsistent use of these terms have created a sprawling body of literature, with various splinter DBR groups hosting scholarly conversations regarding their particular brand of DBR. Second, DBR, as a field, is characterized by a lack of definition, in terms of its purpose, its characteristics, and the steps or processes of which it is comprised. Third, the one consistent element of DBR across the field is an unwieldy set of considerations incumbent upon the researcher. Because it is so difficult to define and conceptualize DBR, it is similarly difficult to replicate authentically. Lack of scholarly agreement on the characteristics and outcomes that define DBR withholds a structure by which DBR studies can be identified and evaluated and, ultimately, limits the degree to which the field can progress. The following sections will identify and explore the three greatest challenges facing DBR today: proliferation of terms, lack of definition, and competing demands. One of the most challenging characteristics of DBR is the quantity and use of terms that identify DBR in the research literature. There are seven common terms typically associated with DBR: design experiments, design research, design-based research, formative research, development research, developmental research, and design-based implementation research. Terminology across disciplines refers to DBR approaches as formative research, development research, design experiments, and developmental research. According to van den Akker (1999), the use of DBR terminology also varies by educational sub-discipline, with areas such as (a) curriculum, (b) learning and instruction, (c) media and technology, and (d) teacher education and didactics favoring specific terms that reflect the focus of their research (Figure 1). Curriculum development research To support product development and generate design and evaluation methods (van den Akker & Plomp, 1993). development research To inform decision-making during development and improve product quality (Walker & Bresler, 1993). formative research To inform decision-making during development and improve product quality (Walker, 1992). Learning & Instruction design experiments To develop products and inform practice (Brown, 1992; Collins, 1992). design-based research To develop products, contribute to theory, and inform practice (Bannan-Ritland, 2003; Barab & Squire, 2004; Sandoval & Bell, 2004). formative research To improve instructional design theory and practice (Reigeluth & Frick, 1999). Media & Technology development research To improve instructional design, development, and evaluation processes (Richey & Nelson, 1996). Teacher Education & Didactics developmental research To create theory- and research-based products and contribute to local instructional theory (van den Akker, 1999). Figure 1. Variations in DBR terminology across educational sub-disciplines. This variation across disciplines, with design researchers tailoring design research to address discipline-specific interests and needs, has created a lack of definition in the field overall. In addition, in the literature, DBR has been conceptualized at various levels of granularity. Here, we will discuss three existing approaches to defining DBR: (a) statements of the overarching purpose, (b) lists of defining characteristics, and (c) models of the steps or processes involved. In literature, scholars and researchers have made multiple attempts to isolate the general purpose of design research in education, with each offering a different insight and definition. According to van den Akker (1999), design research is distinguished from other research efforts by its simultaneous commitment to (a) developing a body of design principles and methods that are based in theory and validated by research and (b) offering direct contributions to practice. This position was supported by Sandoval and Bell (2004), who suggested that the general purpose of DBR was to address the “tension between the desire for locally usable knowledge, on the one hand, and scientifically sound, generalizable knowledge on the other” (p. 199). Cobb et al. (2003) particularly promoted the theory-building focus, asserting “design experiments are conducted to develop theories, not merely to empirically tune ‘what works’” (p. 10). Shavelson et al. (2003) recognized the importance of developing theory but emphasized that the testing and building of instructional products was an equal focus of design research rather than the means to a theoretical end. The aggregate of these definitions suggests that the purpose of DBR involves theoretical and practical design principles and active engagement in the design process. However, DBR continues to vary in its prioritization of these components, with some focusing largely on theory, others emphasizing practice or product, and many examining neither but all using the same terms. Another way to define DBR is by identifying the key characteristics that both unite and define the approach. Unlike other research approaches, DBR can take the form of multiple research methodologies, both qualitative and quantitative, and thus cannot be recognized strictly by its methods. Identifying characteristics, therefore, concern the research process, context, and focus. This section will discuss the original characteristics of DBR, as introduced by Brown and Collins, and then identify the seven most common characteristics suggested by DBR literature overall. Brown’s concept of DBR. Brown (1992) defined design research as having five primary characteristics that distinguished it from typical design or research processes. First, a design is engineered in an authentic, working environment. Second, the development of research and the design are influenced by a specific set of inputs: classroom environment, teachers and students as researchers, curriculum, and technology. Third, the design and development process includes multiple cycles of testing, revision, and further testing. Fourth, the design research process produces an assessment of the design’s quality as well as the effectiveness of both the design and its theoretical underpinnings. Finally, the overall process should make contributions to existing learning theory. Collins’s concept of DBR. Collins (1990, 1992) posed a similar list of design research characteristics. Collins echoed Brown’s specifications of authentic context, cycles of testing and revision, and design and process evaluation. Additionally, Collins provided greater detail regarding the characteristics of the design research processes—specifically, that design research should include the comparison of multiple sample groups, be systematic in both its variation within the experiment and in the order of revisions (i.e., by testing the innovations most likely to succeed first), and involve an interdisciplinary team of experts including not just the teacher and designer, but technologists, psychologists, and developers as well. Unlike Brown, however, Collins did not refer to theory building as an essential characteristic. Current DBR characteristics. The DBR literature that followed expanded, clarified, and revised the design research characteristics identified by Brown and Collins. The range of DBR characteristics discussed in the field currently is broad but can be distilled to seven most frequently referenced identifying characteristics of DBR: design driven, situated, iterative, collaborative, theory building, practical, and productive. Design driven. All literature identifies DBR as focusing on the evolution of a design (Anderson & Shattuck, 2012; Brown, 1992; Cobb et al., 2003; Collins, 1992; Design-Based Research Collective, 2003). While the design can range from an instructional artifact to an intervention, engagement in the design process is what yields the experience, data, and insight necessary for inquiry. Situated. Recalling Brown’s (1992) call for more authentic research contexts, nearly all definitions of DBR situate the aforementioned design process in a real-world context, such as a classroom (Anderson & Shattuck, 2012; Barab & Squire, 2004; Cobb et al., 2003). Iterative. Literature also appears to agree that a DBR process does not consist of a linear design process, but rather multiple cycles of design, testing, and revision (Anderson & Shattuck, 2012; Barab & Squire, 2004; Brown, 1992; Design-Based Research Collective, 2003; Shavelson et al., 2003). These iterations must also represent systematic adjustment of the design, with each adjustment and subsequent testing serving as a miniature experiment (Barab & Squire, 2004; Collins, 1992). Collaborative. While the literature may not always agree on the roles and responsibilities of those engaged in DBR, collaboration between researchers, designers, and educators appears to be key (Anderson & Shattuck, 2012; Barab & Squire, 2004; McCandliss et al., 2003). Each collaborator enters the project with a unique perspective and, as each engages in research, forms a role-specific view of phenomena. These perspectives can then be combined to create a more holistic view of the design process, its context, and the developing product. Theory building. Design research focuses on more than creating an effective design; DBR should produce an intimate understanding of both design and theory (Anderson & Shattuck, 2012; Barab & Squire, 2004; Brown, 1992; Cobb et al., 2003; Design-Based Research Collective, 2003; Joseph, 2004; Shavelson et al., 2003). According to Barab & Squire (2004), “Design-based research requires more than simply showing a particular design works but demands that the researcher . . . generate evidence-based claims about learning that address contemporary theoretical issues and further the theoretical knowledge of the field” (p. 6). DBR needs to build and test theory, yielding findings that can be generalized to both local and broad theory (Hoadley, 2004). Practical. While theoretical contributions are essential to DBR, the results of DBR studies “must do real work” (Cobb et al., 2003, p. 10) and inform instructional, research, and design practice (Anderson & Shattuck, 2012; Barab & Squire, 2004; Design-Based Research Collective, 2003; McCandliss et al., 2003). Productive. Not only should design research produce theoretical and practical insights, but also the design itself must produce results, measuring its success in terms of how well the design meets its intended outcomes (Barab & Squire, 2004; Design-Based Research Collective, 2003; Joseph, 2004; McCandliss et al., 2003). The third way DBR could possibly be defined is to identify the steps or processes involved in implementing it. The sections below illustrate the steps outlined by Collins (1990) and Brown (1992) as well as models by Bannan-Ritland (2003), Reeves (2006), and an aggregate model presented by Anderson & Shattuck (2012). Collins’s design experimentation steps. In his technical report, Collins (1990) presented an extensive list of 10 steps in design experimentation (Figure 2). While Collins’s model provides a guide for experimentally testing and developing new instructional programs, it does not include multiple iterative stages or any evaluation of the final product. Because Collins was interested primarily in development, research was not given much attention in his model. Brown’s design research example. The example of design research Brown (1992) included in her article was limited and less clearly delineated than Collins’s model (Figure 2). Brown focused on the development of educational interventions, including additional testing with minority populations. Similar to Collins, Brown also omitted any summative evaluation of intervention quality or effectiveness and did not specify the role of research through the design process. Bannan-Ritland’s DBR model. Bannan-Ritland (2003) reviewed design process models in fields such as product development, instructional design, and engineering to create a more sophisticated model of design-based research. In its simplest form, Bannan-Ritland’s model is comprised of multiple processes subsumed under four broad stages: (a) informed exploration, (b) enactment, (c) evaluation of local impact, and (d) evaluation of broad impact. Unlike Collins and Brown, Bannan-Ritland dedicated large portions of the model to evaluation in terms of the quality and efficacy of the final product as well as the implications for theory and practice. Reeves’s development research model. Reeves (2006) provided a simplified model consisting of just four steps (Figure 2). By condensing DBR into just a few steps, Reeves highlighted what he viewed as the most essential processes, ending with a general reflection on both the process and product generated in order to develop theoretical and practical insights. Anderson and Shattuck’s aggregate model. Anderson and Shattuck (2012) reviewed design-based research abstracts over the past decade and, from their review, presented an eight-step aggregate model of DBR (Figure 2). As an aggregate of DBR approaches, this model was their attempt to unify approaches across DBR literature, and includes similar steps to Reeves’s model. However, unlike Reeves, Anderson and Shattuck did not include summative reflection and insight development. Comparison of models. Following in Figure 2, we provide a comparison of all these models side-by-side. Figure 2. 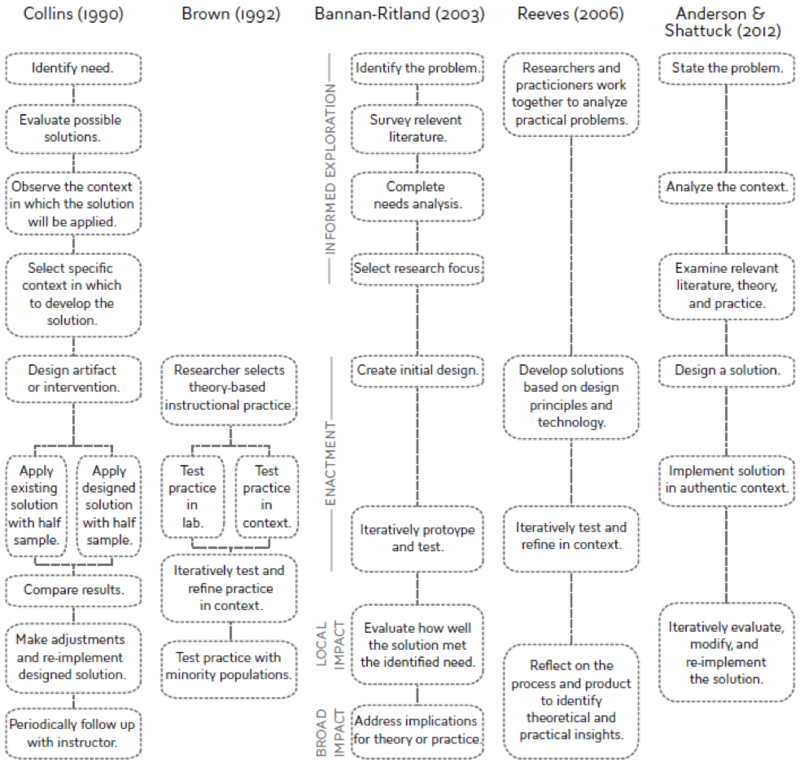 EDR process models by Collins (1990), Brown (1992), Bannan-Ritland (2003), Reeves (2006), and Anderson and Shattuck (2012). The third challenge facing DBR is the variety of roles researchers are expected to fulfill, with researchers often acting simultaneously as project managers, designers, and evaluators. However, with most individuals able to focus on only one task at a time, these competing demands on resources and researcher attention and faculties can be challenging to balance, and excess focus on one role can easily jeopardize others. The literature has recognized four major roles that a DBR professional must perform simultaneously: researcher, project manager, theorist, and designer. Planning and carrying out research is already comprised of multiple considerations, such as controlling variables and limiting bias. The nature of DBR, with its collaboration and situated experimentation and development, innately intensifies some of these issues (Hoadley, 2004). While simultaneously designing the intervention, a design-based researcher must also ensure that high-quality research is accomplished, per typical standards of quality associated with quantitative or qualitative methods. However, research is even more difficult in DBR because the nature of the method leads to several challenges. First, it can be difficult to control the many variables at play in authentic contexts (Collins et al., 2004). Many researchers may feel torn between being able to (a) isolate critical variables or (b) study the comprehensive, complex nature of the design experience (van den Akker, 1999). Second, because many DBR studies are qualitative, they produce large amounts of data, resulting in demanding data collection and analysis (Collins et al., 2004). Third, according to Anderson and Shattuck (2012), the combination of demanding data analysis and highly invested roles of the researchers leaves DBR susceptible to multiple biases during analysis. Perhaps best expressed by Barab and Squire (2004), “if a researcher is intimately involved in the conceptualization, design, development, implementation, and researching of a pedagogical approach, then ensuring that researchers can make credible and trustworthy assertions is a challenge” (p. 10). Additionally, the assumption of multiple roles invests much of the design and research in a single person, diminishing the likelihood of replicability (Hoadley, 2004). Finally, it is impossible to document or account for all discrete decisions made by the collaborators that influenced the development and success of the design (Design-Based Research Collective, 2003). Quality research, though, was never meant to be easy! 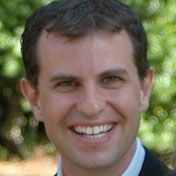 Despite these challenges, DBR has still been shown to be effective in simultaneously developing theory through research as well as interventions that can benefit practice—the two simultaneous goals of any instructional designer. The collaborative nature of DBR lends the approach one of its greatest strengths: multiple perspectives. While this can be a benefit, collaboration between researchers, developers, and practitioners needs to be highly coordinated (Collins et al., 2004), because it is difficult to manage interdisciplinary teams and maintain a productive, collaborative partnership (Design-Based Research Collective, 2003). For many researchers in DBR, the development or testing of theory is a foundational component and primary focus of their work. However, the iterative and multi-tasking nature of a DBR process may not be well-suited to empirically testing or building theory. According to Hoadley (2004), “the treatment’s fidelity to theory [is] initially, and sometimes continually, suspect” (p. 204). This suggests that researchers, despite intentions to test or build theory, may not design or implement their solution in alignment with theory or provide enough control to reliably test the theory in question. Because DBR is simultaneously attempting to satisfy the needs of both design and research, there is a tension between the responsibilities of the researcher and the responsibilities of the designer (van den Akker, 1999). Any design decision inherently alters the research. Similarly, research decisions place constraints on the design. Skilled design-based researchers seek to balance these competing demands effectively. IDR has been encumbered by similar issues that currently exist in DBR. While IDR is by no means a perfect field and is still working to hone and clarify its methods, it has been developing for two decades longer than DBR. The history of IDR and efforts in the field to address similar issues can yield possibilities and insights for the future of DBR. The following sections address efforts in IDR to define the field that hold potential for application in DBR, including how professionals in IDR have focused their efforts to increase unity and worked to define sub-approaches more clearly. Similar to DBR, IDR has been subject to competing definitions as varied as the fields in which design research has been applied (i.e., product design, engineering, manufacturing, information technology, etc.) (Findeli, 1998; Jonas, 2007; Schneider, 2007). Typically, IDR scholars have focused on the relationship between design and research, as well as the underlying purpose, to define the approach. This section identifies three defining conceptualizations of IDR—the prepositional approach trinity, Cross’s -ologies, and Buchanan’s strategies of productive science—and discusses possible implications for DBR. One way of defining different purposes of design research is by identifying the preposition in the relationship between research and design: research into design, research for design, and research through design (Buchanan, 2007; Cross, 1999; Findeli, 1998; Jonas, 2007; Schneider, 2007). Jonas (2007) identified research into design as the most prevalent—and straightforward—form of IDR. This approach separates research from design practice; the researcher observes and studies design practice from without, commonly addressing the history, aesthetics, theory, or nature of design (Schneider, 2007). Research into design generally yields little or no contribution to broader theory (Findeli, 1998). Research for design applies to complex, sophisticated projects, where the purpose of research is to foster product research and development, such as in market and user research (Findeli, 1998; Jonas, 2007). Here, the role of research is to build and improve the design, not contribute to theory or practice. According to Jonas’s (2007) description, research through design bears the strongest resemblance to DBR and is where researchers work to shape their design (i.e., the research object) and establish connections to broader theory and practice. This approach begins with the identification of a research question and carries through the design process experimentally, improving design methods and finding novel ways of controlling the design process (Schneider, 2007). According to Findeli (1998), because this approach adopts the design process as the research method, it helps to develop authentic theories of design. Cross (1999) conceived of IDR approaches based on the early drive toward a science of design and identified three bodies of scientific inquiry: epistemology, praxiology, and phenomenology. Design epistemology primarily concerns what Cross termed “designerly ways of knowing” or how designers think and communicate about design (Cross, 1999; Cross, 2007). Design praxiology deals with practices and processes in design or how to develop and improve artifacts and the processes used to create them. Design phenomenology examines the form, function, configuration, and value of artifacts, such as exploring what makes a cell phone attractive to a user or how changes in a software interface affect user’s activities within the application. 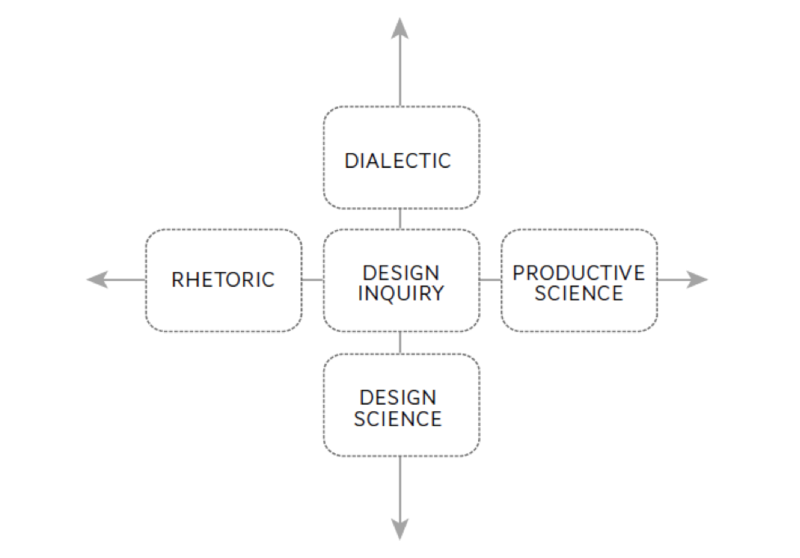 Like Cross, Buchanan (2007) viewed IDR through the lens of design science and identified four research strategies that frame design inquiry: design science, dialectic inquiry, rhetorical inquiry, and productive science (Figure 2). Design science focuses on designing and decision-making, addressing human and consumer behavior. According to Buchanan (2007), dialectic inquiry examines the “social and cultural context of design; typically [drawing] attention to the limitations of the individual designer in seeking sustainable solutions to problems” (p.57). Rhetorical inquiryfocuses on the design experience as well as the designer’s process to create products that are usable, useful, and desirable. Productive science studies how the potential of a design is realized through the refinement of its parts, including materials, form, and function. Buchanan (2007) conceptualized a design research—what he termed design inquiry—that includes elements of all four strategies, looking at the designer, the design, the design context, and the refinement process as a holistic experience. While the literature has yet to accept any single approach to defining types of IDR, it may still be helpful for DBR to consider similar ways of limiting and defining sub-approaches in the field. The challenges brought on by collaboration, multiple researcher roles, and lack of sufficient focus on the design product could be addressed and relieved by identifying distinct approaches to DBR. This idea is not new. Bell and Sandoval (2004) opposed the unification of DBR, specifically design-based research, across educational disciplines (such as developmental psychology, cognitive science, and instructional design). However, they did not suggest any potential alternatives. Adopting an IDR approach, such as the approach trinity, could serve to both unite studies across DBR and clearly distinguish the purpose of the approach and its primary functions. Research into design could focus on the design process and yield valuable insights on design thinking and practice. Research for design could focus on the development of an effective product, which development is missing from many DBR approaches. Research through design would use the design process as a vehicle to test and develop theory, reducing the set of expected considerations. Any approach to dividing or defining DBR efforts could help to limit the focus of the study, helping to prevent the diffusion of researcher efforts and findings. In this chapter we have reviewed the historical development of both design-based research and interdisciplinary design research in an effort to identify strategies in IDR that could benefit DBR development. Following are a few conclusions, leading to recommendations for the DBR field. Overall, one key advantage that IDR has had—and that DBR presently lacks—is communication and collaboration with other fields. Because DBR has remained so isolated, only rarely referencing or exploring approaches from other design disciplines, it can only evolve within the constraints of educational inquiry. IDR’s ability to conceive solutions to issues in the field is derived, in part, from a wide variety of disciplines that contribute to the body of research. Engineers, developers, artists, and a range of designers interpose their own ideas and applications, which are in turn adopted and modified by others. Fostering collaboration between DBR and IDR, while perhaps not the remedy to cure all scholarly ills, could yield valuable insights for both fields, particularly in terms of refining methodologies and promoting the development of theory. As we identified in this paper, a major issue facing DBR is the proliferation of terminology among scholars and the inconsistency in usage. From IDR comes the useful acknowledgement that there can be research into design, fordesign, and through design (Buchanan, 2007; Cross, 1999; Findeli, 1998; Jonas, 2007; Schneider, 2007). This framework was useful for scholars in our conversations at the conference. A resulting recommendation, then, is that, in published works, scholars begin articulating which of these approaches they are using in that particular study. This can simplify the requirements on DBR researchers, because instead of feeling the necessity of doing all three in every paper, they can emphasize one. This will also allow us to communicate our research better with IDR scholars. One recommendation is that DBR scholars adopt these as the characteristics of their work that they will make explicit in every published paper so that DBR articles can be recognized by readers and better aggregated together to show the value of DBR over time. One suggestion is that DBR scholars in their methodology sections could adopt these characteristics as subheadings. So in addition to discussing data collection and data analysis, they would also discuss Design Research Type (research into, through, or of design), Description of the Design Process and Product,Design and Learning Context, Design Collaborations, and a discussion explicitly of the Design Iterations, perhaps by listing each iteration and then the data collection and analysis for each. Also in the concluding sections, in addition to discussing research results, scholars would discuss Applications to Theory (perhaps dividing into Local Theory and Outcomes and Transferable Theory and Findings) and Applications for Practice. Papers that are too big could be broken up with different papers reporting on different iterations but using this same language and formatting to make it easier to connect the ideas throughout the papers. Not all papers would have both local and transferable theory (the latter being more evident in later iterations), so it would be sufficient to indicate in a paper that local theory and outcomes were developed and met with some ideas for transferable theory that would be developed in future iterations. The important thing would be to refer to each of these main characteristics in each paper so that scholars can recognize the work as DBR, situate it appropriately, and know what to look for in terms of quality during the review process. According to the authors, what are the major issues facing DBR and what are some things that can be done to address this problem? Imagine you have designed a new learning app for use in public schools. How would you go about testing it using design-based research? Archer, L.B. (1965). Systematic method for designers. In N. Cross (ed. ), Developments in design methodology. London, England: John Wiley, 1984, pp. 57–82. Archer, L. B. (1981). A view of the nature of design research. In R. Jacques & J.A. Powell (Eds. ), Design: Science: Method (pp. 36-39). Guilford, England: Westbury House. Barab, S., & Squire, K. (2004). Design-based research: Putting a stake in the ground. The Journal of the Learning Sciences, 13(1), 1–14. Buchanan, R. (2007). Strategies of design research: Productive science and rhetorical inquiry. In R. Michel (Ed. ), Design research now (pp. 55–66). Basel, Switzerland: Birkhäuser Verlag AG. Collins, A. (1990). Toward a Design Science of Education. Technical Report No. 1. Collins, A. (1992). Toward a design science of education. In E. Scanlon & T. O’Shea (Eds. ), New directions in educational technology. Berlin, Germany: Springer-Verlag. Collins, A., Joseph, D., & Bielaczyc, K. (2004). Design research: Theoretical and methodological issues. The Journal of the Learning Sciences, 13(1), 15–42. Findeli, A. (1998). A quest for credibility: Doctoral education and research in design at the University of Montreal. Doctoral Education in Design, Ohio, 8–11 October 1998. Friedman, K. (2003). Theory construction in design research: Criteria: approaches, and methods. Design Studies, 24(6), 507–522. Hoadley, C. M. (2004). Methodological alignment in design-based research. Educational Psychologist, 39(4), 203–212. Jonas, W. (2007). Design research and its meaning to the methodological development of the discipline. In R. Michel (Ed. ), Design research now (pp. 187–206). Basel, Switzerland: Birkhäuser Verlag AG. Jones, J. C. (1970). Design methods: Seeds of human futures. New York, NY: John Wiley & Sons Ltd.
Joseph, D. (2004). The practice of design-based research: uncovering the interplay between design, research, and the real-world context. Educational Psychologist, 39(4), 235–242. Oh, E., & Reeves, T. C. (2010). The implications of the differences between design research and instructional systems design for educational technology researchers and practitioners. Educational Media International, 47(4), 263–275. Reeves, T. C. (2006). Design research from a technology perspective. In J. van den Akker, K. Gravemeijer, S. McKenney, & N. Nieveen (Eds. ), Educational design research (Vol. 1, pp. 52–66). London, England: Routledge. Reigeluth, C. M., & Frick, T. W. (1999). Formative research: A methodology for creating and improving design theories. In C. Reigeluth (Ed. ), Instructional-design theories and models. A new paradigm of instructional theory (Vol. 2) (pp. 633–651), Mahwah, NJ: Lawrence Erlbaum Associates. Richey, R. C., & Nelson, W. A. (1996). Developmental research. In D. Jonassen (Ed. ), Handbook of research for educational communications and technology (pp. 1213–1245), London, England: Macmillan. Sandoval, W. A., & Bell, P. (2004). Design-based research methods for studying learning in context: Introduction. Educational Psychologist, 39(4), 199–201. Schneider, B. (2007). Design as practice, science and research. In R. Michel (Ed. ), Design research now (pp. 207–218). Basel, Switzerland: Birkhäuser Verlag AG. Simon, H. A. (1969). The sciences of the artificial. Cambridge, MA: The MIT Press. Tabak, I. (2004). Reconstructing context: Negotiating the tension between exogenous and endogenous educational design. Educational Psychologist, 39(4), 225–233. van den Akker, J. (1999). Principles and methods of development research. In J. van den Akker, R. M. Branch, K. Gustafson, N. Nieveen, & T. Plomp (Eds. ), Design approaches and tools in education and training (pp. 1–14). Norwell, MA: Kluwer Academic Publishers. van den Akker, J., & Plomp, T. (1993). Development research in curriculum: Propositions and experiences. Paper presented at the annual meeting of the American Educational Research Association, April 12–14, Atlanta, GA.
Walker, D.F., (1992). Methodological issues in curriculum research, In Jackson, P. (Ed. ), Handbook of research on curriculum (pp. 98–118). New York, NY: Macmillan. Walker, D. & Bresler, L. (1993). Development research: Definitions, methods, and criteria. Paper presented at the annual meeting of the American Educational Research Association, April 12–16, Atlanta, GA.
Kimberly D. N. Christensen is a consultant focusing on research, experience design, and human factors in software and consumer product development. 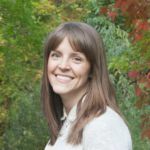 She is also an adjunct professor with Brigham Young University – Idaho and the University of Utah’s Multi-Disciplinary Design program, teaching applied research methods and human-centered design.